irth Solutions announces the latest version of UtiliSphere, which includes Intelligence Center with new interactive geographical maps, new reports menu and upgrade to Microsoft SQL Server 2012. The newest version of UtiliSphere brings together data with better views, including interactive geographical maps, to provide a deeper understanding of underground product delivery systems, ultimately helping to optimize product flow. irth Solutions ®, an innovative provider of cloud-based asset management solutions for the utility and energy industries, announces version 2013.2 of UtiliSphere. The latest version enables organizations to have greater insight and visibility into data from multiple sources within Intelligence Center through new interactive geographical maps. o Interactive Mapping: See historical and current information on one map. 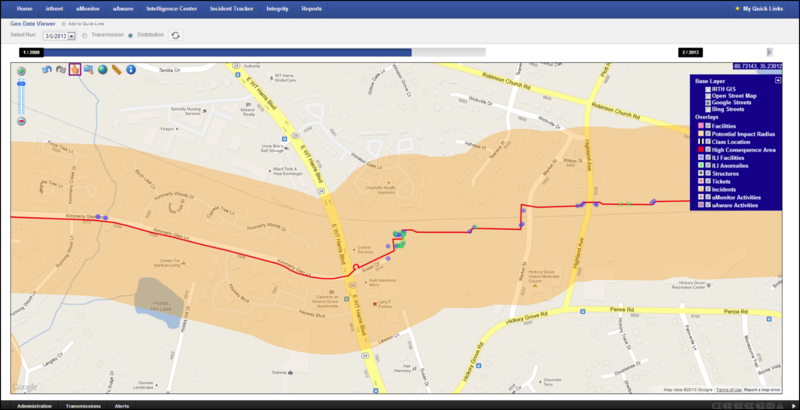 Manipulate the data elements that are displayed on the map by choosing from multiple data layers, including dig tickets, high-consequence areas, class locations, in-line inspection data, incidents and accidents, public awareness, and field operations data layers. o Trending and Analysis: Display data for a single year or display data for all years to view trends and easily slide to a year to choose the timeframe for the data displayed on the map. o New Reports/Exports Menu – All reports can now be found in a central location. o Exports - Access raw data from UtiliSphere using an intuitive GUI for export to another application, such as GIS. Users can define the data set and view, and can export the data as a Flat File, XML, CSV, etc. o Ticket Count Summary Report – Displays historical data of year, total tickets, total overdue tickets, and average response times all in one report within irthnet. o Integrity Management Downloads – Access Integrity Management-related information such as high-consequence areas, class locations and in-line inspection data, via UtiliSphere. Automatic notifications alert organizations when any document is available to download as part of the UtiliSphere Integrity Services offering. o Upgrade to Microsoft SQL Server 2012 – Features increased security, scalability and performance among many other improvements for better support. Availability: Version 2013.2 of UtiliSphere is available now. For more information contact sales(at)irthsolutions(dot)com or visit http://www.irthsolutions.com/intelligence-center. irth Solutions®, Technologies For Earth™, provides innovative cloud-based asset management solutions to gas, oil, electric, telecommunications and other utility companies, and to One Call Centers across the country to increase operational efficiency, improve workforce productivity, comply with regulatory requirements, and ensure safety. For nearly two decades, irth Solutions has been meeting the unique needs of the energy & utility industries with unmatched service and groundbreaking solutions for delivery system protection, safety and compliance. Investors include Columbus-based Crane Group and Main Street Capital, located in Houston. Learn more by visiting http://www.irthsolutions.com.